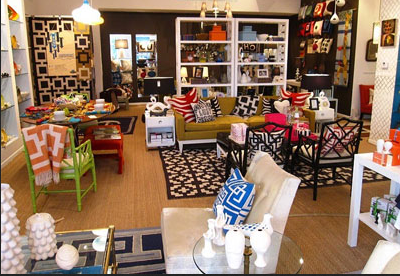 If you haven’t experienced The World of Jonathan Adler, tonight is the time to share in his magic in Austin. The famed home designer and author is jetting in to officially open his new Austin location with a star-studded evening and the town is abuzz. Adler, in his inimitable way, will be signing copies of his new book, 100 Ways To Happy Chic Your Life. With such a festive title, who could resist? He also promises fist bumps and nibbly bits, per the invitation. A portion of the proceeds from this evening will benefit AIDS Services Austin’s Octopus Club and is hosted by Paul Scott, Scott Simons, Lance Avery Morgan, Rob Giardinelli, Mark Erwin and Stephen Rice. Along with cocktails and crudités, we expect all the Sociables to arrive en masse to pick up anything from couches to vases and other can’t-miss decorative items that line the store. 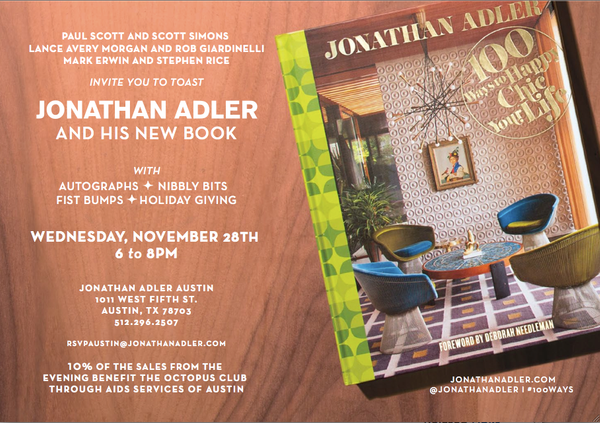 For more information on Adler, visit www.jonathanadler.com and for more information on the Octopus Club, visit, www.Octopusclub.org.